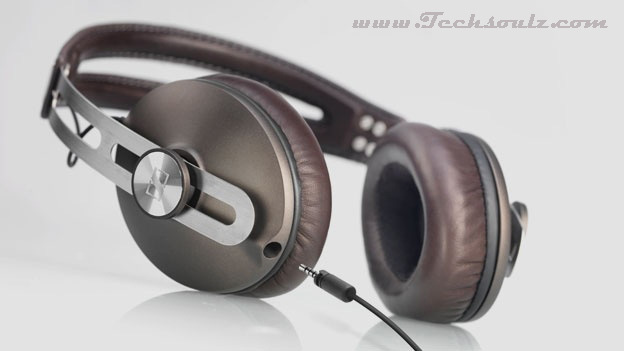 Style is one of the factors sought after by audiophiles when it comes to selecting good headphones. If your headphone, apart from sounding good can make a style statement, then it’s a win-win situation. Here’s an example of great style combined with an inimitable, tangible sound. Consider headphones and Sennheiser has to be amongst the first three names that come to your mind. They have managed to create that strong an impact on users in our country. The best part about this company is that they have an option for all buyers no matter how small or big their pocket is. This time for our ‘Portables Special’ issue, we received their newly launched Sennheiser Momentum headphones. We have seen all types of headphones from Sennheiser that don a sporty look or, for that matter, the out of this world look of the HD800 headphones. This time, they have managed to surprise us yet again with a completely different look from what we have seen till date from them earthy look that boasts of a dark brown leather pad with a brown casing. It feels like even Sennheiser is in the mood to join the ‘Save the Planet’ mission—good for them. The new look is really refreshing and presents a good break to the usual shades of functional black and silver used in most AV products around. We also liked the compact approach as the headphones occupy really small real estate and therefore score very high on portability. And that is particularly great when you consider the fact that they can’t be folded. In terms of technology, there is not much of an overhaul here. The headphones house the regular high performance neodymium magnets that can be seen in all Sennheiser headphones. The circumaural headphones boast of an ergonomic design with utility stamped all around it. In order to cope with the multi-tasking that people want from their devices, they have also added an extra cable that can be connected if you will be using the Momentum with an iPhone or an iPod. You can control the playback on the phone using the small jog dial on the cable. That’s all that we could talk about in the technology section. We have already mentioned that the headphones score very high in the portability section, particularly for their compact design. We are sure that some of you would find it a little weird that we are saying this in spite of knowing that the headphones can’t be folded so that it becomes easier to carry them. Because of the compact design, there is absolutely no need for the headphones to be folded and one can easily carry them in the provided casing. The casing is really well built and, will fit in any bag pack or even a tote bag. Prima facie, the headphones managed to impress us, but we wanted to see if they lived up to the high expectations that come tagged along with the name Sennheiser. As it turned out, they do. They present a very balanced overall tone without undue emphasis placed on either the highs or lows. But that does not mean that we found the sound of the headphones ﬂat. The sound had a very high entertainment quotient wherein the high-end wore a soothing sparkle that cut through the mix and a tight and punchy lower-end. We played Amit Trivedi’s latest album ‘Kai Po Che’, for which the Sennheiser’s were truly a delight. The songs are rich in orchestration and the Momentum really set the pace up for a prolonged listening session. The ‘dhol’ (also implies the kick drum) was extremely punchy and the bassline was powerful and warm, without being too boomy or overpowering the rest of the mix. The major highlight was that no matter how much we cranked up the music, there was not even a slight trace of distortion. Obviously, we had our own limits in terms of listening volume and the Sennheiser did a great job at whatever volume we played it on. Some of you might not like the slightly laidback sound of the Momentum as they are not too open as compared to some other headphones from Sennheiser itself. But this laidback sound is a strong reason that we think was instrumental in making the headphones sound as great as they do. The only problem is if you have slightly bigger than average ears then you will fi nd it a bit uncomfortable to wear the headphones for longer durations, like an hour or so. But a small break of five minutes should do the trick.